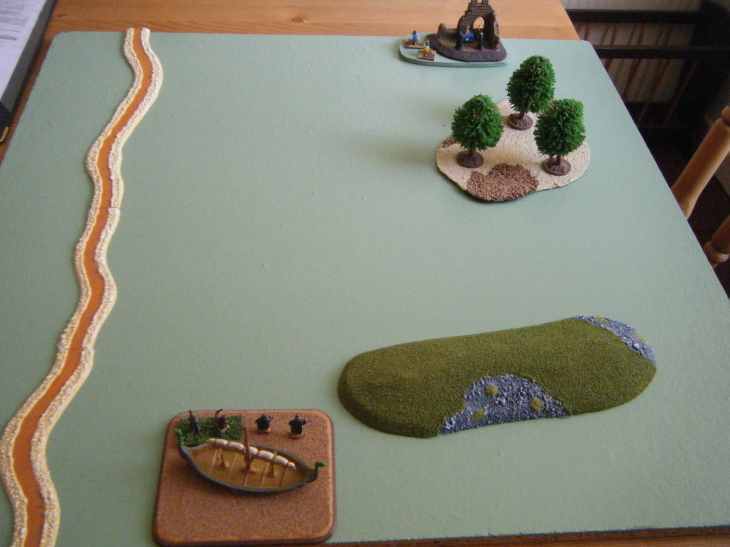 This scenario/battle report follows on from the previous one, a couple of posts down. 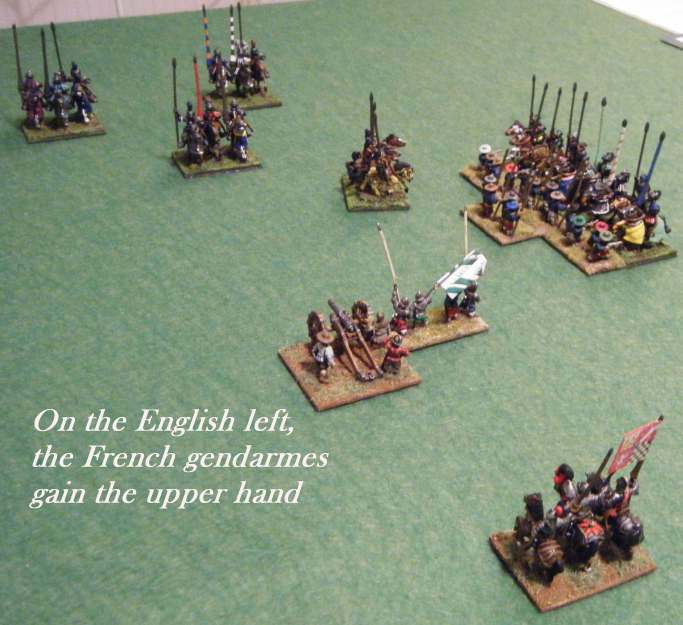 As before, I command the French and the decisions of the English commander are determined by a “percentage probability” dice throw. This works by looking at the various options available and weighting them as to how a decent general would choose to act, then dicing for the actual decision; in this game, the actions of each separate “battle” of the English line are diced for. Turn One: I move the Gendarmes on my right to outflank the English on the hill, and advance my Pike & Shot lines in the centre towards the enemy. 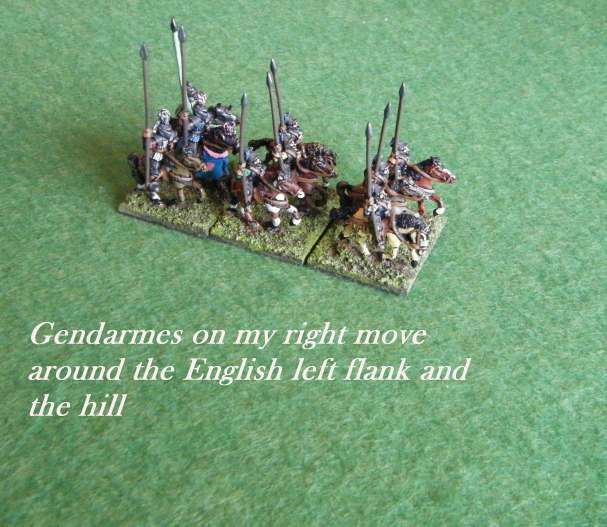 The English general, aware that he needs to protect his Levies, advances his Landsknechts (who have some surviving Bill & Bow units at the end of their line) towards my oncoming infantry; he makes some minor adjustments to the dispositions of the troops protecting his camp to counter the move by my Gendarmes; and he throws the mixed units on his right flank towards my left (which is a little weaker); the Levies hold their position. Turn Two: My left flank holds its position while I continue to advance in the centre, and my Gendarmes continue their manoeuvre on my far right. 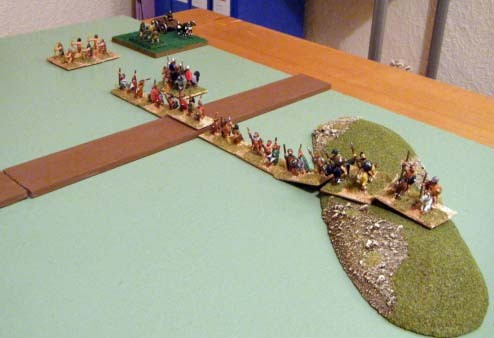 The English commander gets an attack of the jitters – or perhaps his troops do – all along the line, and their advance judders to a halt! 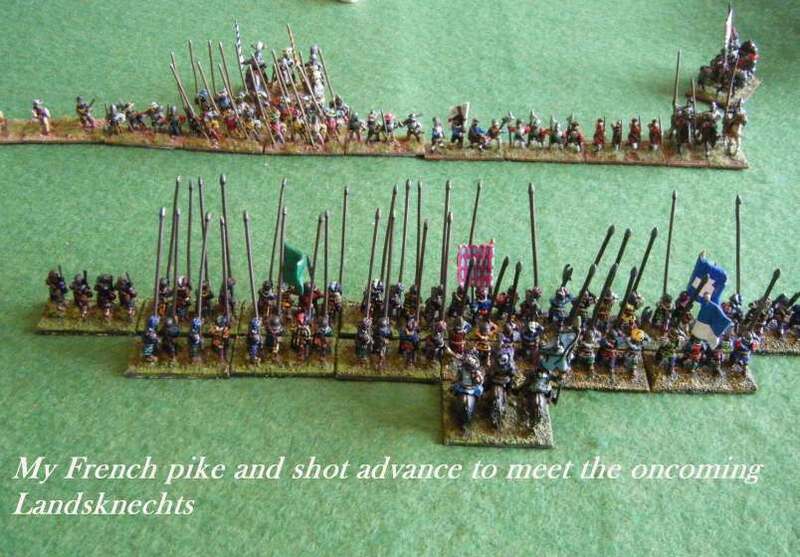 Turns Three and Four: The main action is in the centre of the battlefield, where the Landsknechts and the handful of remaining English take heavy losses against my Pike & Shot. 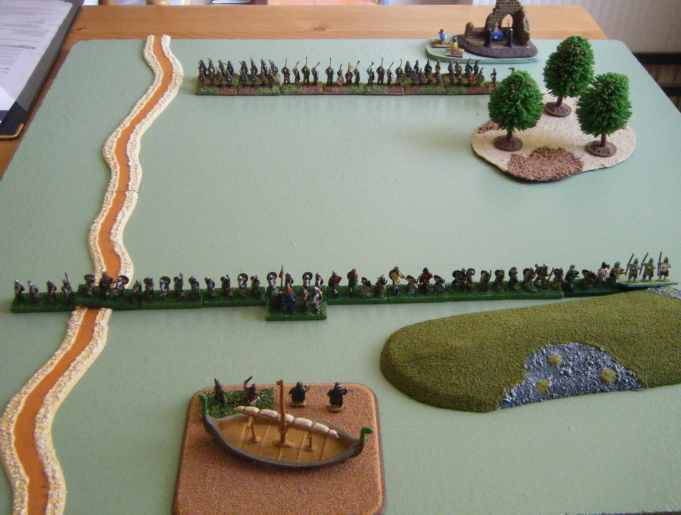 On my left flank the two sides face each other but don’t advance into combat; on my right, the demonstration by my Gendarmes succeeds in immobilising the troops guarding the English camp. Turn Five: The English centre continues to fragment. 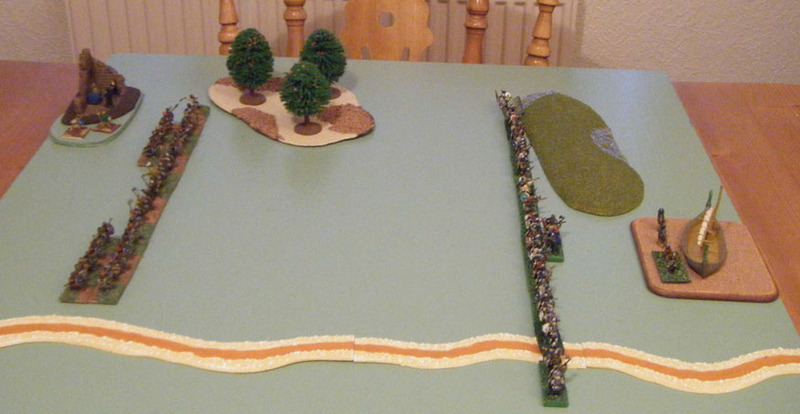 In response the English commander finally throws his Levies into the battle – they join the rest of his right flank in an advance on my left. 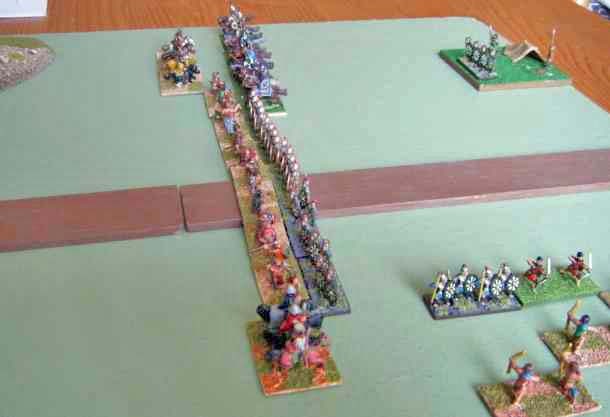 Turn Six: My centre grinds to a halt and provides the Landsknechts with a chance to regroup their depleted forces. 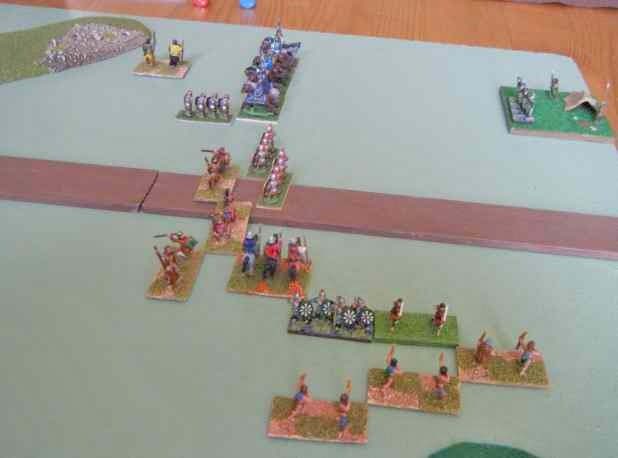 Checked for morale, a number of the English Levies flee, but the remainder advance along with the English right against my left flank; in addition, some Levies armed with arquebuses succeed in shooting down one of my Gendarme units! 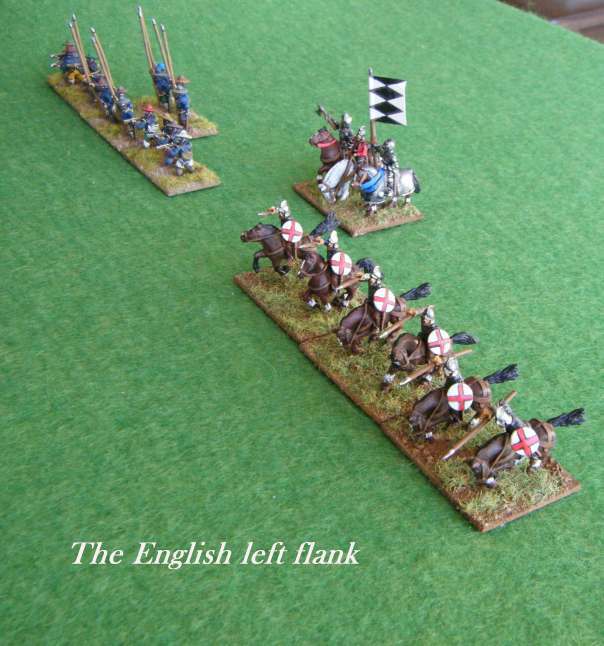 Turns Seven and Eight: The remnants of the Landsknechts in the centre – around half their original strength – succeed in regrouping and halting my advance. 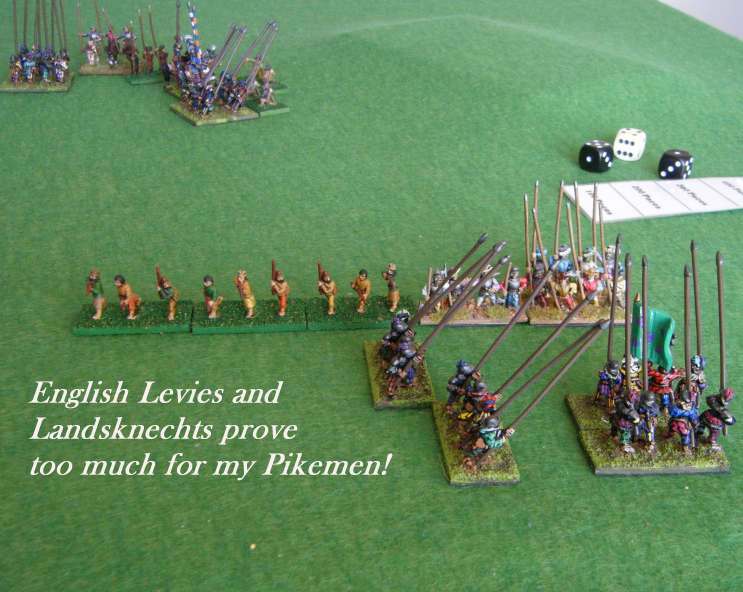 The Levies take heavy casualties but have held up my Pike & Shot column on my left flank, while on my far left the English are having by far the better of the combats. On my right, the Gendarmes are almost within charge distance of the English camp. Turns Nine to Eleven: A single unit of German Shot hold off my Gendarmes’ attack on the camp, while some of my Pikes detach themselves from the centre to attack the camp from the other side. In the centre the Landknechts continue to hold their ground, while the English are still having the better of the fighting on my left and centre left. It’s turning into an extremely bloody – and rather indecisive – battle! 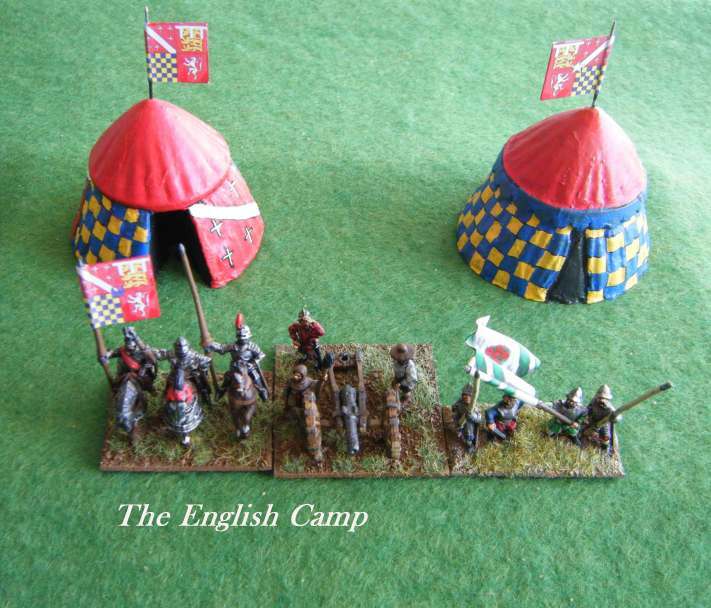 Turns Twelve to Fourteen: My Pikes and Gendarmes finally succeed in taking the English camp, but across the rest of the battlefield my battered troops are in retreat! 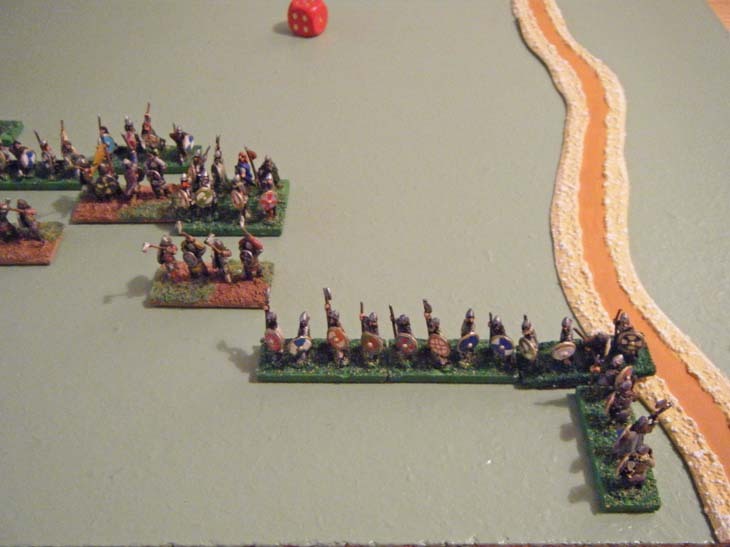 The English resolve – combined with some lucky dice throws – has served to inflict such heavy losses on my troops that I have no option but to sound the retreat. Still, at least we’ve got some booty to carry back to our ships…before we head back to France! 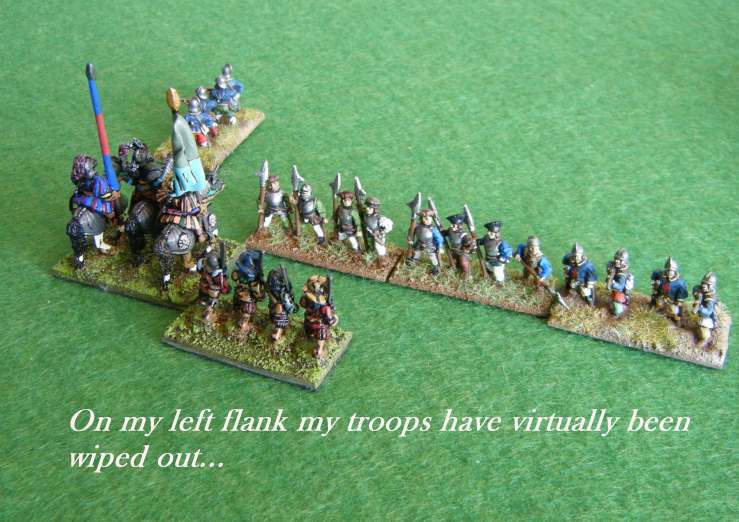 I suppose we’ve all endured those awkward moments when an opponent points out that the epaulets on your guard battalion are painted the wrong shade of blue. It’s been a while since I’ve bought a wargames magazine, but finding myself at a loose end on a journey back to Bristol from the far north (Doncaster to be precise), I decided to treat myself to the latest issue of Miniature Wargames (March 2011). Just as well, because otherwise I would have missed Chris Hahn’s hypothetical account of a battle between the Spanish (recently landed from the successful Armada crossing) and Elizabeth’s English levies. This “what if” scenario got me thinking, and inspired me to try out a similar speculative scenario set a few decades earlier. 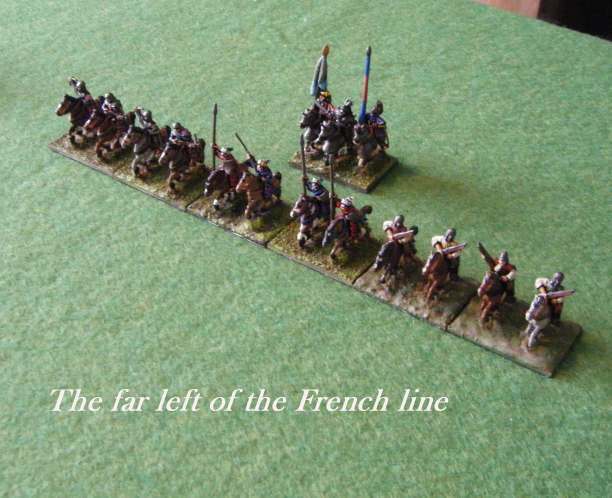 This time it’s the French who have successfully disembarked a landing force on English soil, and it’s Liz’s dad Henry who has to face them in battle as they move inland. 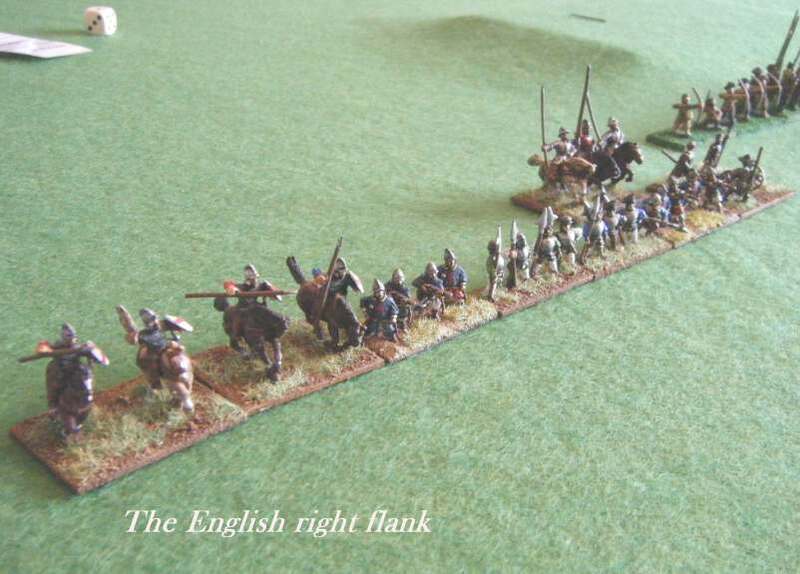 The English force consists of the usual “bills and bows”, a sizeable contingent of German mercenaries (including a large rearwards reserve), some border horse, three artillery pieces, and a handful of heavy cavalry. Somewhere off the table a small force of English volunteers (indifferently armed and trained) are marching to the sound of the guns – they will arrive at some point in the battle, but precisely when and from which direction remains to be seen. 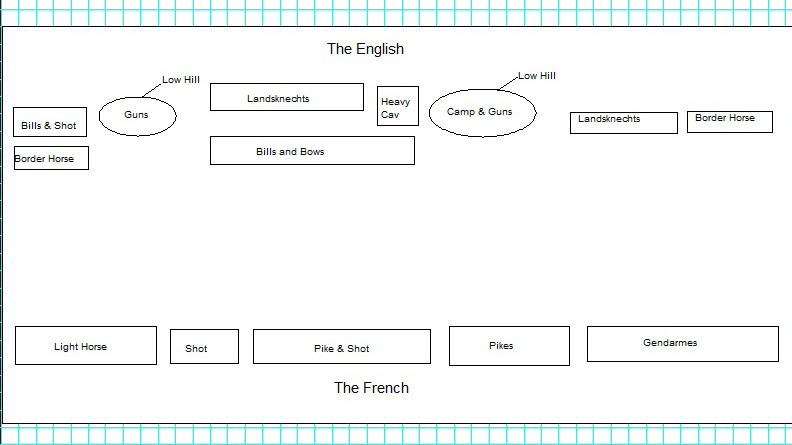 The English are very much on the defensive, and will hold their positions unless and until the French (controlled by me) take the initiative; at that point each wing of the English army will have its course of action determined by “percentage probability” dice throws, having weighed up the chances of a good officer taking one or other of the available courses of action. 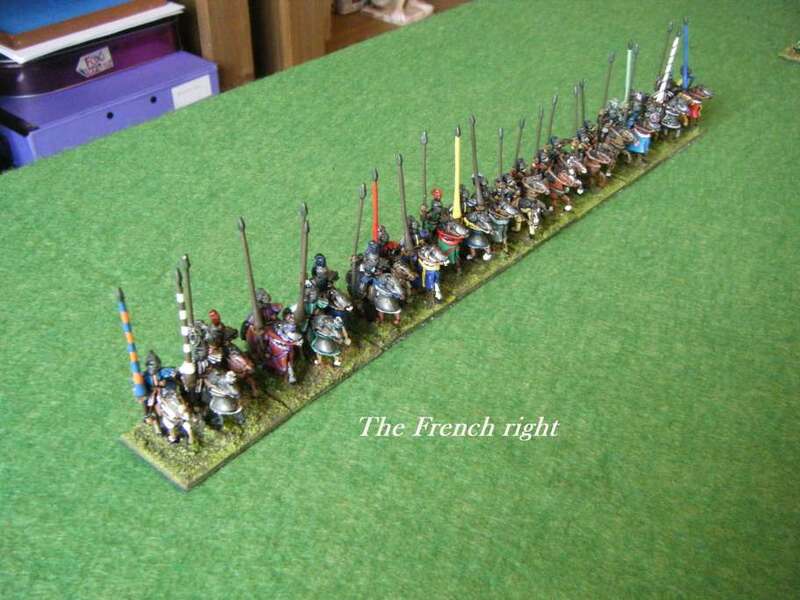 The French have landed a strong, well balanced army, but have not had time to bring up their artillery. They field the more modern pike and shot combination, as well as their usual strong force of gendarmes and well-trained light horse. 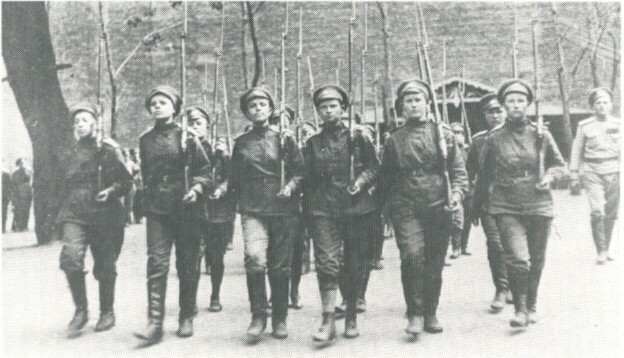 They are aware of the possibility of English reinforcements, and have therefore every incentive to attack the English positions as soon as they are able. Turn One: My line advances, contracting at certain points to avoid the enemy artillery positions as far as possible. 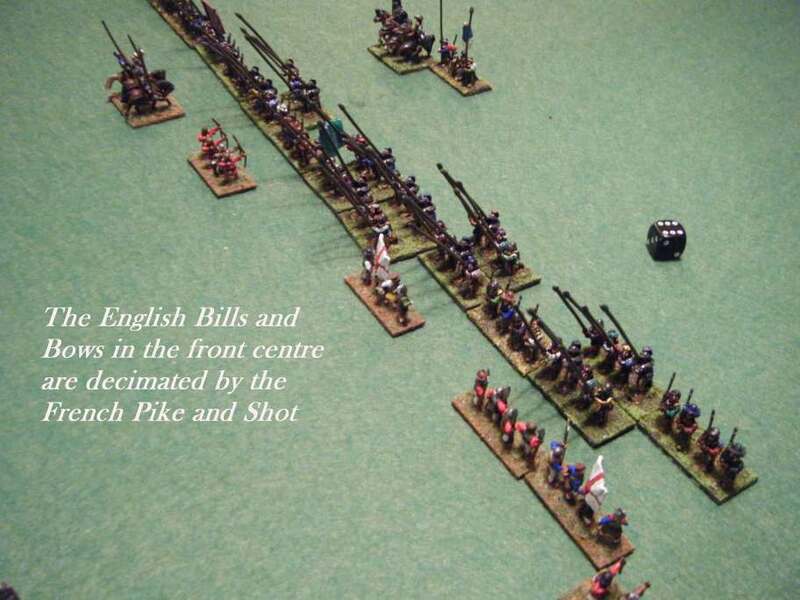 The English hold position, apart from the Heavy Cavalry in the centre, who move to reinforce and extend the central line of Bills and Bows. Turn Two: My French continue to advance, though a split starts to appear in the centre where the centre-right begins to lag behind. 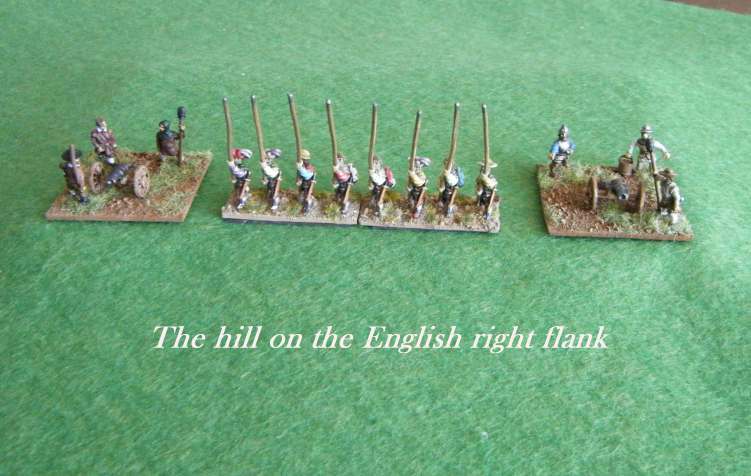 The English respond by mustering their troops into a single line on either flank, and two units of Landsknecht pikemen come down off the low hill nearest their right flank to threaten my Shot. Turn Three: I continue to advance, but the split in my centre widens further. 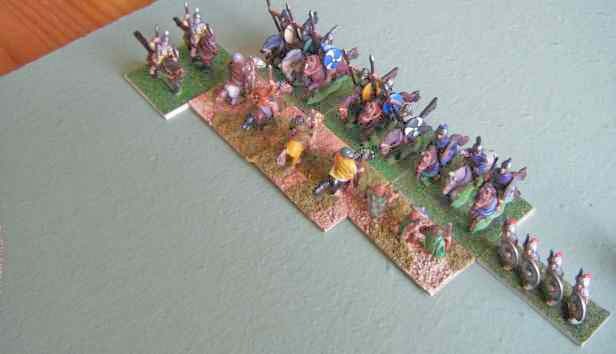 The English left (Landsknechts and Border Horse) advance slowly towards my gendarmes, somewhat against the odds, reinforced by an additional pike unit from the adjacent hill. 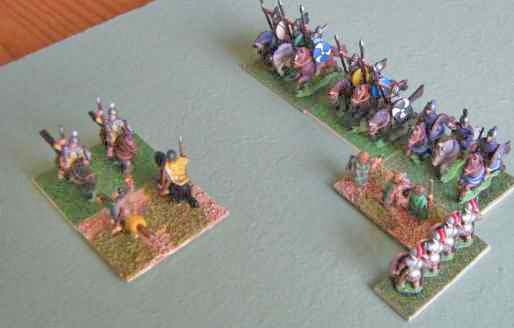 On my own left my advancing Light Horse now face a solid line of mixed English troops. 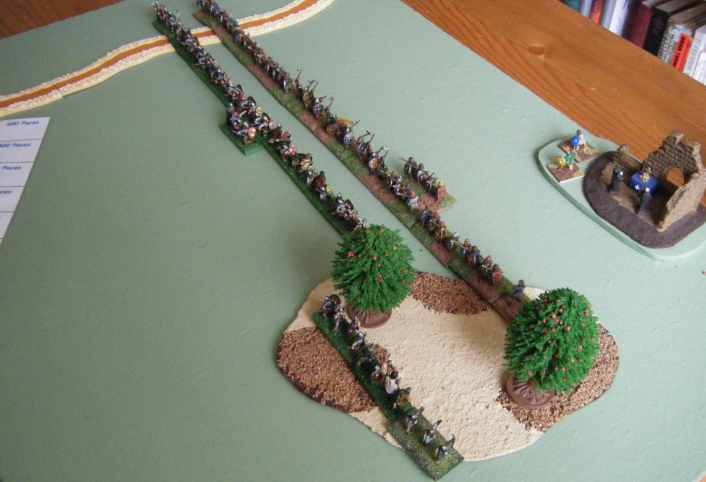 Meanwhile the English guns on the hill to the right of their line are moved to provide better cover to the infantry. Turn Four: My advance on the left halts as I attempt to bring up my Shot. In the centre too I hold while the stragglers catch up with the main line. The gendarmes continue to canter forwards. The English and Germans facing them continue their advance, though the additional pikes that moved last turn grind to a halt. 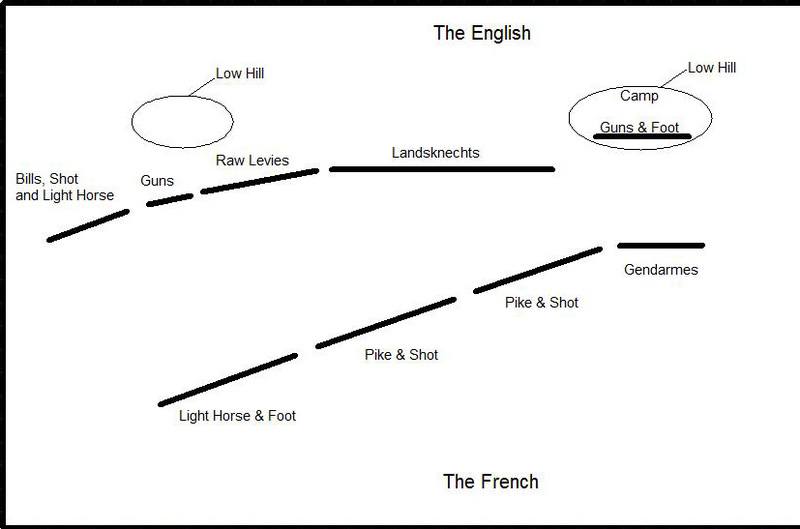 In the centre the English continue to adjust their lines, while on the English right the main force halts. 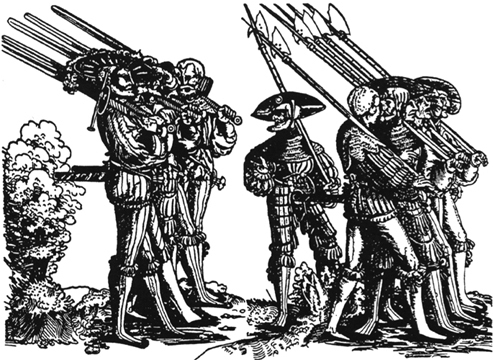 The Landsknechts that advanced down from the hill, however, have ideas of their own – and charge towards my lines! Turn Five: On my left, I turn my attentions to screening the advancing English and cutting off the detached Landsknechts. As the English centre continues to hold its position, I advance with the majority of my troops but still have problems with a large split in my battleline. On my right flank, my gendarmes and the mixed English/German force facing them are almost within charging distance now. 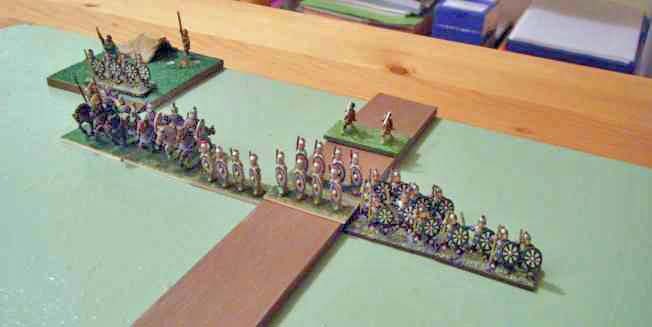 Turn Seven: The two flanks move into contact. 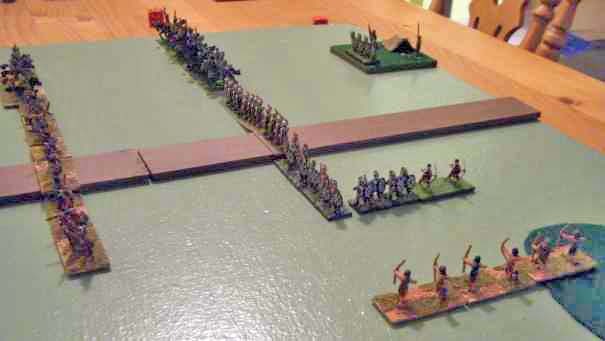 The ensuing combats are indecisive, with both sides taking minor losses. 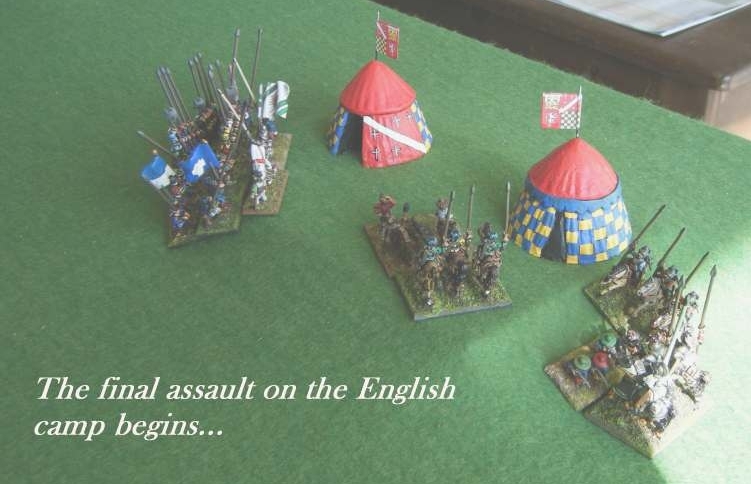 The English centre continues to advance as I attempt to form up my troops to face them. 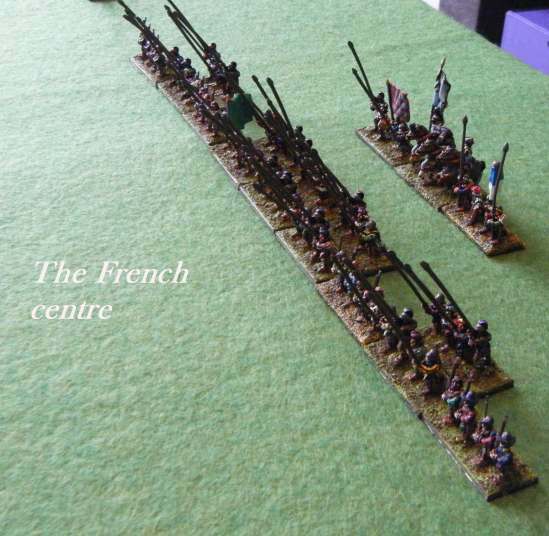 Turns Ten & Eleven: The English centre crumbles as the Bills and Bows face but fail to stop the state-of-the-art French infantry. Meanwhile my left flank has all but disintegrated, while my gendarmes are grinding out a narrow advantage over on my right flank. 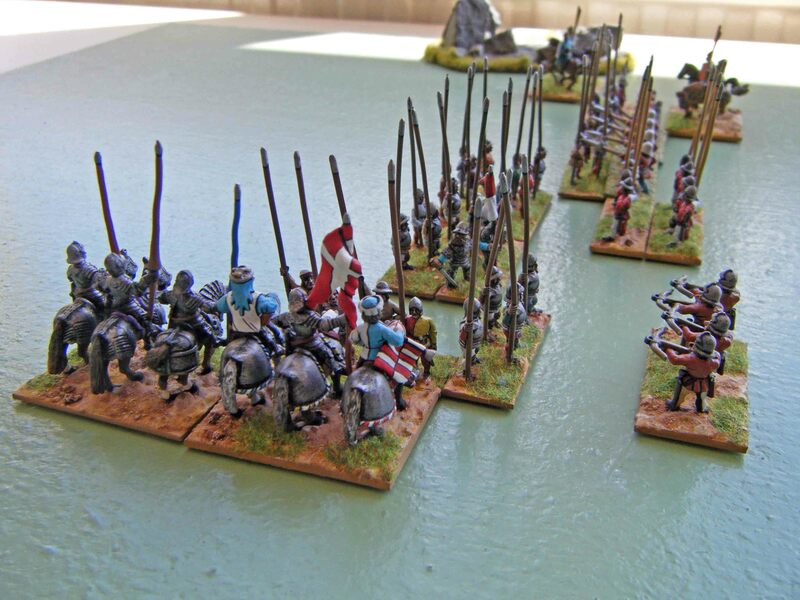 With the English Landsknecht mercenaries still advancing in the centre rear, the game is still finely balanced. Turn Twelve: The English finally succumb on my right flank, their ragged German pikemen and arquebusiers being surrounded and cut down by my gendarmes. In the centre, the Bills and Bows have virtually been annihilated. On the English right, the rosbifs have the advantage, and only a few of my mounted units and shot remain intact. 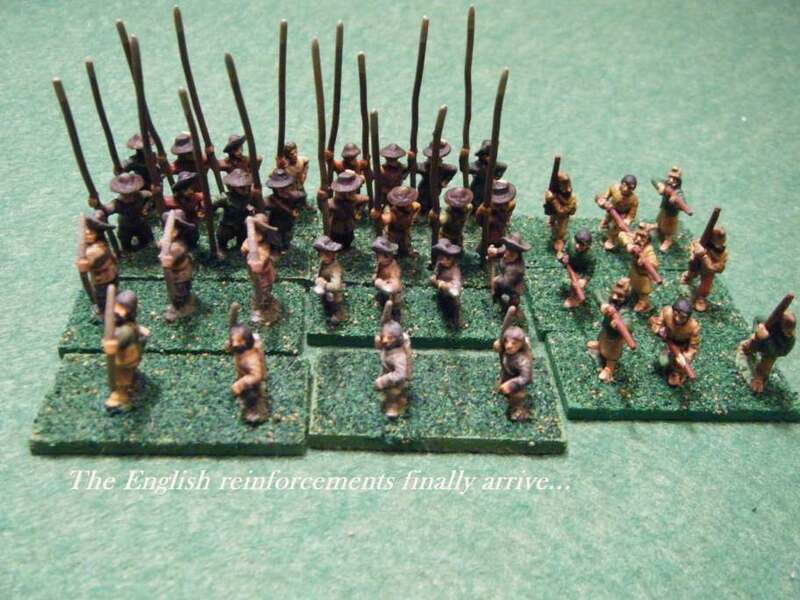 And it is precisely at this moment that the English reinforcements arrive, appearing on the baseline of the English army on their right flank! 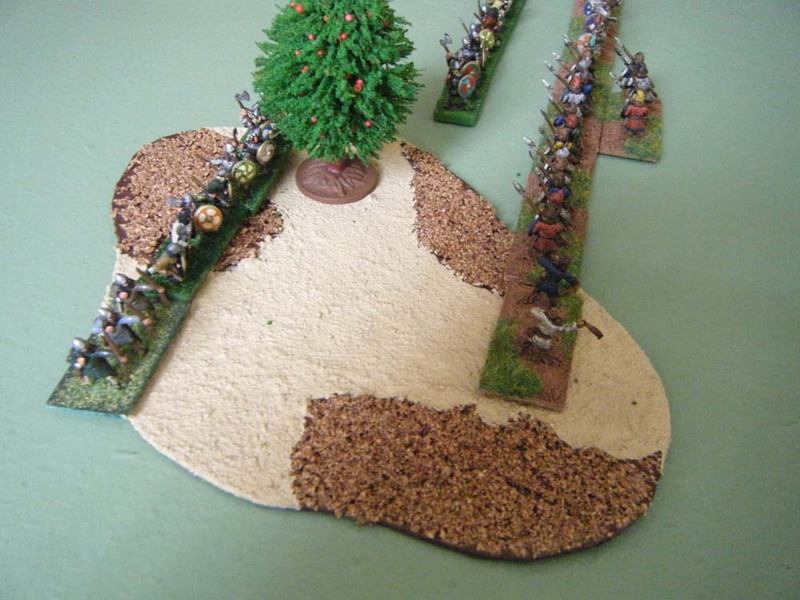 Both sides now have troops scattered across the battlefield, and the situation is indecisive. 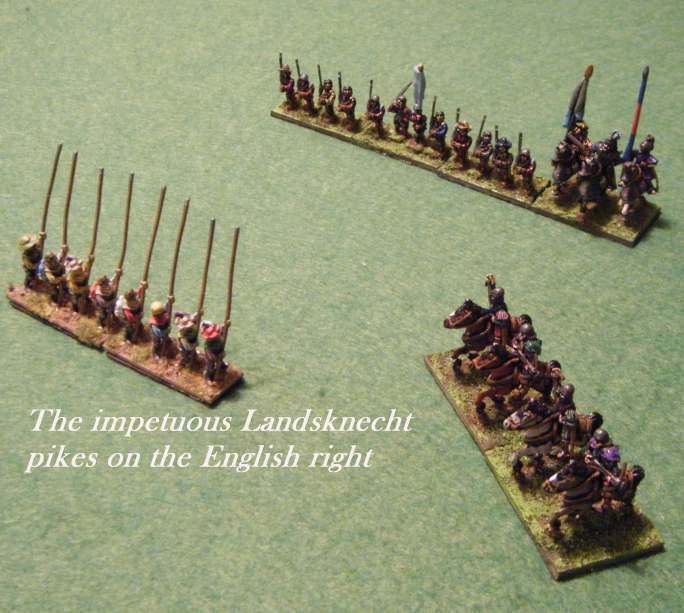 The unengaged Landsknechts and the reinforcements mean that the English are far from beaten. My left flank has disintegrated, and my right is a little ragged. While my centre remains strong and has taken few losses, I don’t much like the look of the situation and decide to retreat and re-group. 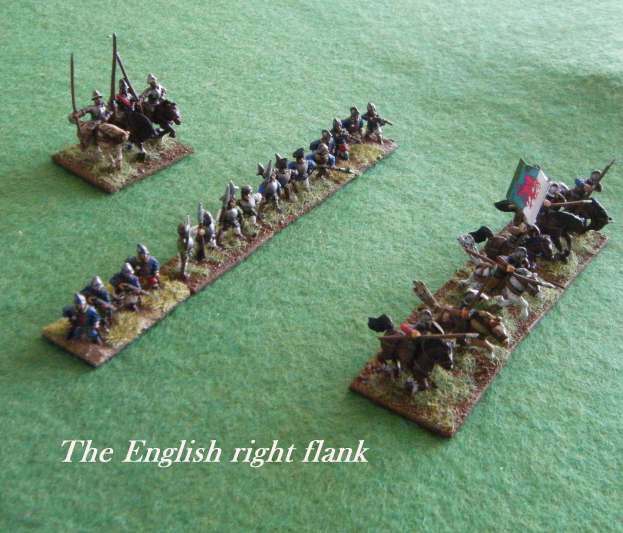 The English commanders opt to do the same rather than press home with an immediate and rather risky counter-attack (a decision determined by dicing for percentage-weighted options), and draw back to reform their own lines and integrate the newcomers. The battle appears to have reached a stalemate. I varied the positioning rules for the Brit camp as, with my three Psiloi against their one, it wouldn’t have made sense to place it near the wood (marked here by a patch of green felt – minimalism rules!). 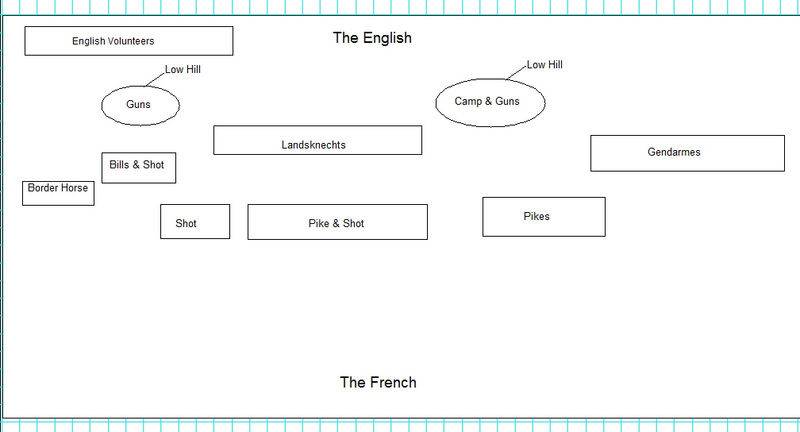 The camp was garrisoned by the odd unit of Brit spears. 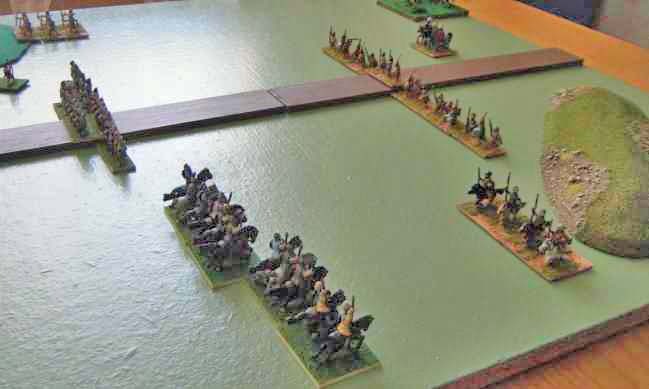 I then followed Richard’s deployment rules and this resulted in a mass of Brit spears in the centre backed up by a unit of psiloi in reserve, with the cavalry and light horse on the centre right and far right of the line. Back on my right wing I used my cavalry general to flank another spear unit which was summarily dispatched – it was now 3 -2 to the NPG. 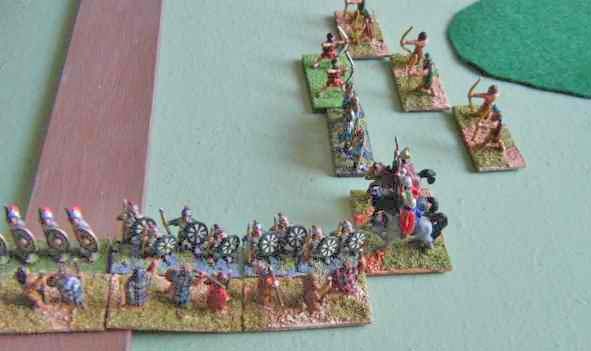 However, back on the left wing and the left centre the NPG came over all aggressive and moved to flank my left-most spear unit. My poor Picts crumbled, and it was game over, despite the fact that my light horse took out the Brit light horse in a final gesture of defiance. Richard’s solo rules worked well with some minor tweaking, and provided me with a useful NPG opponent. Great fun! 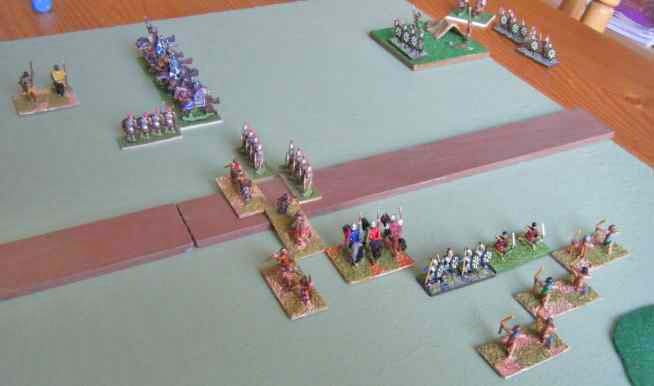 The defensive approach taken by the Saxons made their defeat almost inevitable, but I suspect that was a result of my uninspired interpretation of the NPG’s options rather than any flaw in Richard’s rules. The board set-up and deployment worked well, and the NPG behaved in a manner that more or less fitted the period and the contending forces. Next time though I think I’ll try a tougher match-up and a more mobile opponent, to see how well the solo variant works in those conditions. Comments Off on Oh, Those Mercenaries!